When Charter Schools Fail, Where Do Kids Go? The teenage girls knew they were being loud when they belted out Michael Jackson's "Man in the Mirror" and the gospel favorite "We Lift Our Hands" during lunch at New Orleans' Sojourner Truth Academy charter school. But they never expected that school officials would slap them with out-of-school suspensions just for singing in the cafeteria. "They said we needed to be 'toned down,' " says Breion Burns, 18, one of eight students issued one-day suspensions for the boisterous singing in November 2011. The official reason listed on the suspension slips was "willful disobedience." Two other students received two-day suspensions for allegedly cursing amid the singing. Several of the suspended girls were honors students who worried that the blot on their record would jeopardize their college admissions. They could not understand why administrators had opted for suspension over a milder punishment like detention. In schools across the U.S., out-of-school suspensions have become the default punishment not only for drug possession and fights but also for threats, displays of affection, dress-code violations, truancy, tardiness, refusal to follow directions, even 4-year-olds' temper tantrums. Suspension rates have more than doubled over the past three decades across all grade levels. At the same time, racial gaps have widened: black students are 3 1/2 times as likely to be suspended or expelled as their white peers, according to Department of Education data released earlier this spring. The Office for Civil Rights gathered the data from 72,000 schools in 7,000 districts, which educate approximately 85% of the country's students. That survey found that 1 in 5 African-American boys received an out-of-school suspension during the 200910 academic year, compared with about 1 in 14 white boys. National studies have also revealed persistent, although more modest, gaps between white and Hispanic students. Suspension terms usually vary from one to 10 days, depending on the gravity of the offense and the district's policies. Experts say too few people link the rising and disparate discipline rates to lost learning time  a crucial connection, given the stubbornness of the achievement gap between black and white students. Some schools even prohibit suspended students from making up missed work. 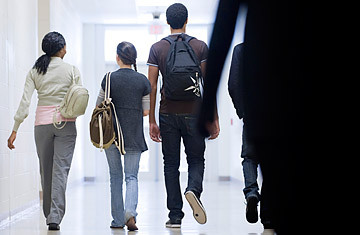 A 2011 study of school discipline in Texas found that students suspended or expelled for "discretionary offenses"  those for which state law does not automatically call for an automatic suspension or expulsion  were twice as likely to repeat a grade as those who had not received such punishment. The study compared students from similar demographic groups and schools in an attempt to isolate the effect of school discipline as much as possible, although it could not prove that time away from school directly caused the children to be held back. "[Suspension] makes no sense, because students are losing class time," says Daniel Losen, a senior education law and policy associate for the Civil Rights Project at UCLA. "They are often not being supervised. They are not learning anything. No one is teaching them about misbehavior. No one is making sure they are prepared to return to school." Many teachers agree. They caution, however, that when a few disruptive students consistently prevent their classmates from learning, the needs of the majority should take precedence. "We know suspension usually doesn't work for the suspended student," says Nick McDaniels, an English teacher at Mergenthaler Vocational-Technical High School in Baltimore, a city that has cut its number of annual suspensions by thousands over the past five years. "But there is a certain point when suspension benefits everyone else."